Am I using too much crinp ? 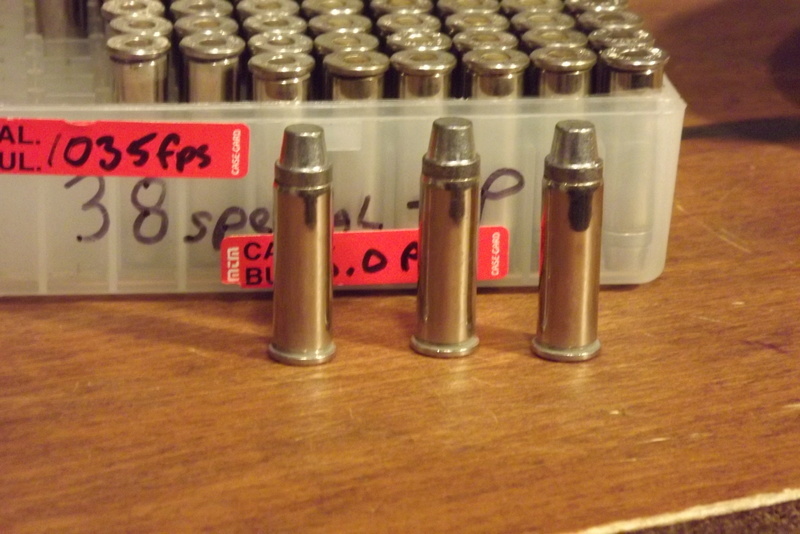 The load is 38 cal, 158 gr tcbb lead, 3.0, 3.3 and 3.5 gr of WST. I am seating to the crimp groove with a fairly decent amount of crimp. My groups with all three loads is 4 to 5" at 50 feet in door range. I am shooting these loads out of a model 19 357 mag 4" barrel. Do you think I am crimping too much or should I be using 357 mag cases ? Re: too much crimp ? Are you using a Lee Factory crimp die? Sizing the bullets smaller, while loaded in the case? Get a Redding Profile Crimp die for ALL roll crimp applications. As the load goes up, the crimp needs to increase. Your load may need no more than taper crimp or, depending on level, a really good roll crimp in the crimp groove. I am using an RCBS carbide die set. I think I may have been crimping too much. I am load 3.0 and 3.3 of WST, am I right in thinking that load doesn't need a real heavy crimp. I will try to put up some pics if I can figure out how to do it. ON Penn's weebsite there is a pic of the 158 gr tcbb bullet, maybe someone could look and advise me where I should be crimping on the bullet ? Have you measured your crimp? If not do so. And do it at least three times taking the average. No one can tell you something is too much or too little until they know what the something is. My crimp. The Round nose are the most accurate out of my wheel guns (DR Legal rounds) But I have a lot of SWC bullets so I tried a little hotter load to see if I could get better groups. That's a bunch of bullets I need to just shoot up. Sounds like it may be too little crimp if anything. Look at the round in this image https://goo.gl/images/bFyT8h. Your case mouth should be rolled or skived looking like this one. You should seat to the crimp groove for your initial tests as in a long chamber like a revolver there isn't much to be gained about seating depth unless you need powder volume. Hodgdon lists 3.7 as max for WST. Wobbley wrote: Sounds like it may be too little crimp if anything. Look at the round in this image https://goo.gl/images/bFyT8h. Your case mouth should be rolled or skived looking like this one. You should seat to the crimp groove for your initial tests as in a long chamber like a revolver there isn't much to be gained about seating depth unless you need powder volume. Hodgdon lists 3.7 as max for WST. Do you have a measurement for your crimp ? 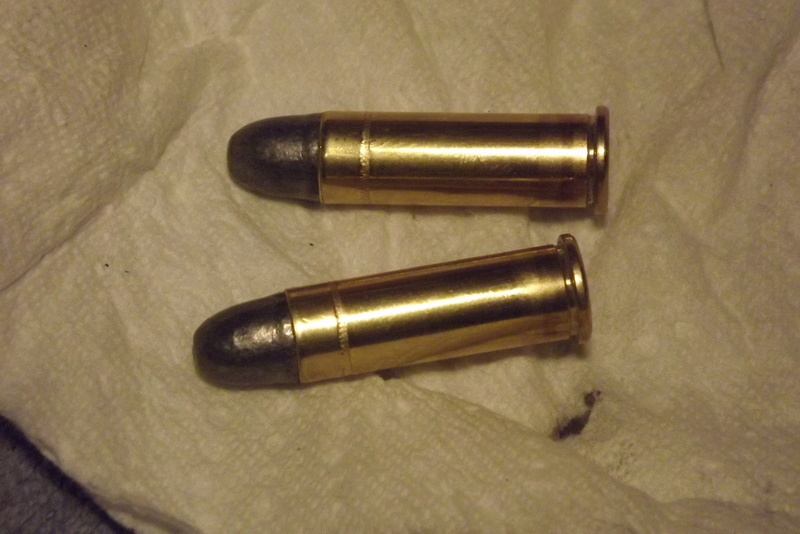 With Remington brass and my FL size die the un-crimped brass is .375 and I crimp to .372. Dependent on your brass it sounds like you have no crimp. I increased the crimp to .374 and it made quite a difference in group size. I am using starline brass not federal, my mistake. Thank you for the advice, I appreciate it.